The Wotton Electric Picture House in Market Street, claims to be one of the oldest cinemas in the Country! In 1911, Mr and Mrs William Coe purchased the de-licenced Crown Inn, situated on the edge of the Stoney Chipping opposite The Star Inn. It was reported to have cellars dating back to Cromwellian times. They opened the Electric Picture House in an upstairs former banqueting room in 1913. This was so successful that by 1920 the room was not large enough to meet the demand. It was decided to demolish the adjacent stable block and build a new auditorium. This opened in 1921 and seated 220 customers. Some seats were plush and children were seated on wooden seats at the front; boys on the left and girls on the right. Tickets were priced at 2d (pence) , 3d and 6d. The installation of “talkies” equipment took place in 1931 and coloured films were shown on Bank Holidays as a special treat. The cinema’s own generator was not good enough so gas was used to power the equipment, resulting in the dimming of the street lights in Market Street. The Coes had some amusing ways of dealing with customers. Too much noise and the film would be stopped, lights switched on and the naughty boys ejected. A smoky auditorium would be sprayed with disinfectant. If a film broke down, the audience would stamp noisily on the bare boards. During World War II, the cinema was patronised by the US military stationed in the Town. Tickets were now 2s 3d, 1s 9d and 9d. An air raid siren had been fitted at the Fire Station (now the Heritage Centre) and when the alarm was sounded, all the dialogue was drowned out. In 1947, the cinema was sold to a retired Farmer, Mr C M Jenner and run by Vera and Reg Grimshaw, his daughter and son-in-law, until 1960. Television was beginning to affect audience numbers. 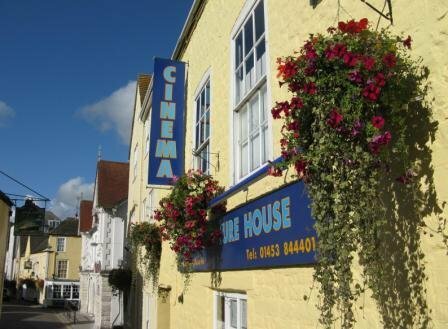 Wotton then formed its first Film Society and Adrian Wicks, a projectionist, joined Michael Chappell in 1963, to re-open the cinema on a commercial basis for about 18 months. Rent was £36.00 a quarter, five shows a week, admission 2s 6d. In a new series of identities, the hall became a Bingo venue, then was bought by the Boxing Club and finally re-opened as a cinema in 1993. It was run by Jess Elton until 2002 even staying open on Christmas Day, a fairly unique event! After two public meetings, a mission statement and business plan were put together. The creation of a management committee and three years of hard work followed. Planning permission was obtained, fund-raising commenced and the physical labour of enthusiastic volunteers supported by many townsfolk and organisations resulted in the cinema re-opening in 2005. The Cinema is still going strong under a fully professional team who replaced the volunteer management in 2014. This being the long-term objective of the volunteers from the first meeting in 2002. A very successful project by the residents of Wotton under Edge. *Including a donations to the Historical Society and Heritage Centre. -Ed.